The third subclasses are coming back in Destiny 2. 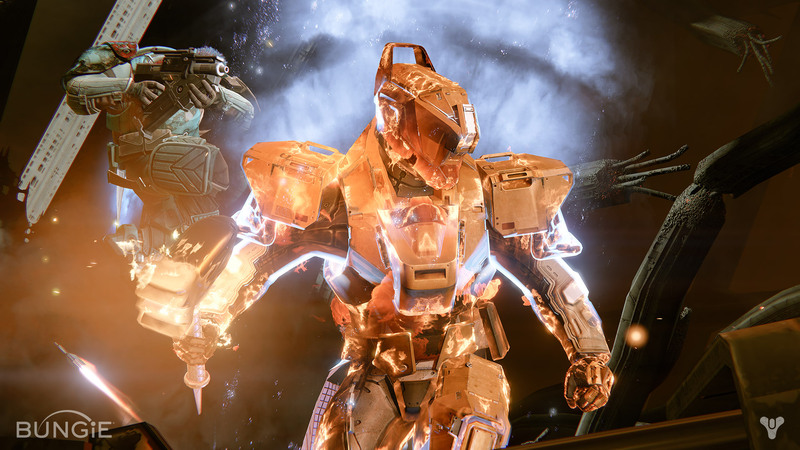 When the Taken King finally brought the third subclass to Destiny, the Titan Sunbreaker was on of the strongest classes we've ever had in Destiny. Titans will be happy to know that their third subclass is coming back, the Sunbreaker Titan will be available in Destiny 2. However, the Sunbreaker will behave a little different than you are used to. The third subclass follows the same streamlined approach as the others, with less perk options to choose from. The Hammer of Sol was always a roaming super, so the third subclass in Destiny 2 will not see much changed compared to the original Destiny. Activating your Super Ability will allow you to throw flaming hammers, with each throw depleting your meter significantly. You can throw your hammers with R1/RT. Your meter will not deplete as fast as the Golden Gun when not using the hammers, but it will deplete. Incendiary Grenade - The Incendiary grenade causes a Damage over time burn. Thermite Grenade - This grenade will produce a wall of fire. Fusion Grenade - The Fusion is the third subclass's version of a sticky, and will do additional damage to enemies it is attached to. The Sunbreaker class ability creates a barricade by holding B or Circle. You can put out a large barricade to wall off areas, or you can put out a smaller one that still allows you to fire from behind it. Towering Barricade – A large barrier that can be used for cover or to seal off dangerous areas for a short time. Rally Barricade – A small barrier that allows you to peek over it while aiming down sights and instantly reloads your equipped weapon when you take cover. All three Titan subclasses share the same jumps, so if you are used to the Striker you will have an easy transition to the Sunbreaker. Increased Height – Upgrades Lift to travel to greater heights. Increased Control – Upgrades Lift for better directional control while in the air. Catapult – Upgrades Lift to provide a strong initial burst of momentum. Catapult is usually solid for PvP, Control for Raid jumping puzzles, and Height for those hard to reach exploring areas on Patrol. Perks in Destiny 2 are now grouped into two clusters, with the perks of each cluster activating together. This means you cannot select one perk from one cluster, and three from the other. While this would seem to limit player choice, it may create two usable builds instead of the top tier one that everyone used in Destiny 1. Hammer Strike - A melee ability that triggers a hammer strike while sprinting. This might behave similar to the shoulder charge from original Destiny. Tempered Metal - Solar kills give you an nearby allies a speed boost and reload buff. Vulcan's Rage - Hammers shatter on impact, dealing AoE damage. Mortar Blast - Melee strikes will deal damage to nearby enemies. Sun Warrior - Solar ability kills restore health. Melee and Grenade will leave a Sunspot. Rings of Fire - Solar Abilities recharge faster and your super lasts longer while standing in a Sunspot. Solar Siege - Hammer strikes create a Sunspot on impact. Throw Hammers faster while standing in Sunspots. The Siegebreaker looks to behave like a PvE class, since standing in one spot is rarely a good idea in PvP. However, the thrid subclass Sunbreaker in Destiny 2 looks to have two very strong Codes, one for PvE and one for PvP. For more Destiny 2 coverage, including the other Titan Subclasses, check out our complete Destiny 2 guide.